You must pass this before you can book your driving test. 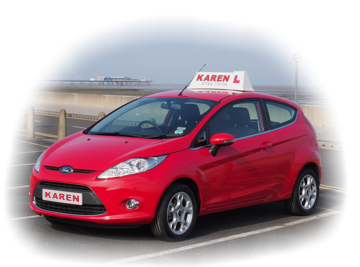 It makes sense to learn your theory questions at the beginning of your driving lessons. The sooner you learn your theory the better. It will help with your driving lessons, e.g. knowing what certain signs mean, knowing the sequence of pedestrian lights, etc. Multiple Choice section - you must score 43 out of 50 questions. Hazard Perception videos - you must score 44 out of 75. Remember to use the official DVSA website as other sites can charge you booking fees! This is just a test to check your ability to drive. The examiner will use a DL25 marking sheet and will mark all minor and serious faults that occur in approx 40 mins. You must avoid all serious incidents but are allowed to make minor mistakes. No one is perfect, not even me. You are allowed up to 15 minor faults. It starts in a waiting room. An examiner will come out and in introduce themselves then get you to sign a form when they check your license details. Then you will be on your way to the car (with or without me - your choice). You will be asked two safety questions called "Show Me, Tell Me" questions, and one of these is whilst driving. Then you will start your test. You will drive on a variety of roads and your ability will be tested. You must carry out one reverse manoeuvre and a 20 minute section of independent driving. You will be informed at the end of the test whether you have been successful. There is loads of information out there on the driving test. The DVSA website is one of the more accurate. There are also forums of other candidates' experiences. Get yourself familiar with the format to help relax about the unknown.